The first one we tried was a Planet egg. I saw this one online last year and wanted to try it out. However, I thought something was missing. What goes better with a planet than an alien on a spaceship? I came up with a really easy alien and ship. The boys had lots of fun making the eggs, although Higgins was a little upset that he couldn't fly his alien and the spaceship around. 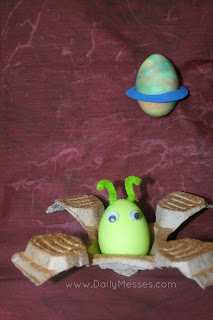 Planet Eggs: These are pretty easy to make but look super cool. The original directions online said to use a tie dye kit to create the eggs. However, I found that if I added less water to normal egg dyes and used a Q-tip and cotton ball to blot the dye on the egg, it worked just as well as the tie dye kit. Blot with a rag to keep the dye from running and let dry. 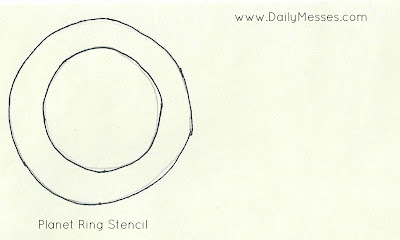 Next, cut out a ring from a craft foam sheet or cardstock paper. Cut out an inner circle in the ring to fit the egg. Place the egg inside the ring and you have your planet! 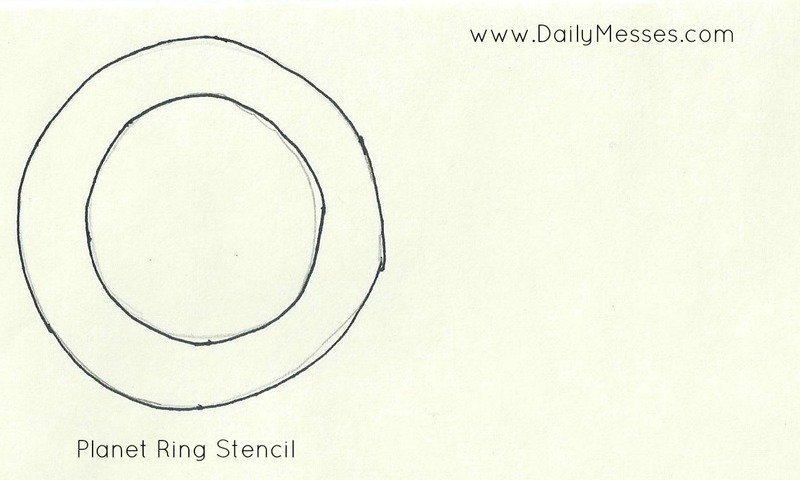 DM Tip: I have a stencil below for the ring. This fit the egg I used, which was a large white egg. Alien eggs: Dye an egg green (or blue, purple, etc.). Add on googly eyes and pipe cleaners for antennae. I attached with glue dots. For an extra wow, make a spaceship out of an old egg carton, drink carrier, or toilet paper/paper towel roll (cut out paper triangles and glue on for rocket fins). DM Tip: To get more of a lime green color, I used Betty Crocker Neon Food Gel. I mixed it with a tablespoon of vinegar and about 3/4 cup water to create the egg dye.